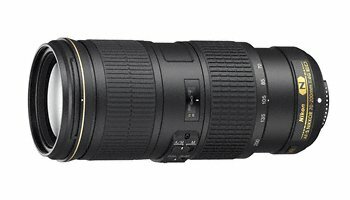 Nikon have announced a new 70-200mm lens, the AF-S NIKKOR 70-200mm f/4G ED VR. FX-format telephoto zoom lens with 70–200mm focal range (105–300mm when used with a Nikon DX-format SLR). Constant f/4 aperture throughout the zoom range. Vibration Reduction (VR) system: minimizes camera shake and lets you shoot at shutter speeds up to five stops slower. Nano Crystal Coat greatly reduces ghosting and flare. SWM (Silent Wave Motor) enables quiet and accurate autofocus. Two focus modes: A/M (autofocus with manual override, AF priority) and M (manual focus). Minimum focus distance: 1 m.
Lightweight body for a telephoto zoom lens. RT-1 tripod collar ring (optional accessory): enables the lens to be rotated freely for smooth transition between vertical and horizontal orientation.